Model Name: Cosmograph Daytona "Paul Newman"
Launched in 1966, reference 6241 was mainly cased in stainless steel. Scholars estimate that no more than 3000 examples were made during the model’s production period. Of these, less than a quarter were dressed in precious metal. The present example however is a tier above the 18K gold version as it is the even more rare 14K version. It is speculated that 14K gold watches were made in order to minimize the high import taxes on gold watches some countries had in place at the time. 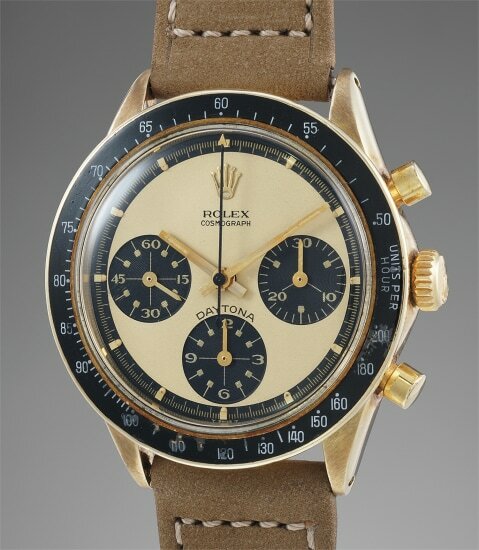 The scarcity of the gold version - to a modern eye an oddity, as today gold sport wristwatches are commonplace - is apparent when considering that the Daytona was, at the time of its inception, a watch intended for car racers. Thus, it needed to be light and sturdy and a stainless steel case was the most obvious choice, while the opposite holds true for gold. The true protagonist of this timepiece is however its champagne Paul Newman dial. Absolutely correct for its 2 million serial number, it is preserved in superb condition, fully retaining all of its luminous accents without the slightest loss of material. The surface of the dial is flawless: no mark, scratch or even age spots can be seen even after meticulous examination. This previously unknown timepiece can without a doubt be considered one of the most appealing Champagne Newman 6241 to come to the market in virtue of its rare 14K gold case and astounding dial. Given the amount of interest which has been circling the Daytona model over the past years, it is not a stretch to say that the discovery of another such piece with a dial as appealing as this one is a highly improbable occurrence.